GH5 10bit files are working perfectly on Mac Resolve 12.5.5, it may be your Windows system. Can you give a download link of the clip so that I do the test again in Davinci Resolve? I'm in doubt since Peter Cave says that the GH5 422 10-bit clips are well read by Davinci Resolve. Can anyone on PC (Windows 10 PRO X64 + DR 12.5.5) confirm that the GH5 422 10 bit clips are working properly? It meant to work with Studio version and looks like it does on Mac but not on PC. It does not work on PC but on MAC (studio version). This thread has 101 answers and not a single person except Peter Cave could not read a GH5 10 bits 422 with Davinci Resolve (including on MAC?). Good anyway to know. If a client comes with a GH5 10 bit clip => I would go to friends who have Macs for a direct trancodage in Prores. Rohit Gupta wrote: This is supported in 12.5.5. Only in the Studio version. I'm on 12.5.5 studio and two 10 bit sample GH5 clips (one UHD, one C4K) are showing as Media Offline. Can u post a link to your sample clips. And your full system details. I think they're looking into it. Andrew Kolakowski wrote: I think they're looking into it. I can also confirm 4K 10 bit files from my GH5 camera cannot be loaded in Resolve Studio 12.5.5 on Windows. In any case the long GOP: I do not like them and they must be fitted for assembly. I have a tool that turns them into .MOV CINEFORM 10 bits at ~ 9-10 fps. Well recognized by Davinci Resolve in 10 bits. Sure but I would rather trust Resolve to do that for me with Media Management, not some other tool. They really need to keep the versions in feature parity. The 10bit files do not play in Quicktime Player, it is Resolve that can play them. Apple have not updated for Mac also. Fantastic for you and possessors of MAC. Especially Mac users : do not pass on PC => everything is best for you! You could use ProRes instead. Well, for ffmpeg transcoding at downscaled HD resolution there's DNxHD is also, but for preserved UHD transcoding with ffmpeg, I agree, ProRes is really the only practical 10-bit 422 option. I just wanted to leave stone un-turned. The quality metric testing was done with AVISynth using FFMS2Mod as the decoder/file-indexer for the original clip and mov/mxf transcodes. For the Cineform avi transcodes I used AVIsource. FFMS2Mod evidently had issues decoding the ffmpeg and AME DNxHR-HQX transcodes, both showing overt block artifacts. So in those cases I transcoded the DNxHR-HQX files to v210.mov with ffmpeg for the SSIM testing. I couldn't be fussed measuring PSNR also; I find SSIM a more meaningful measure for quantifying fine differences at the 'visually lossless' level. All of the transcodes there listed could be imported by Resolve, I should add. Last edited by Bryan Worsley on Sun Apr 09, 2017 11:12 pm, edited 1 time in total. You must downloaded latest build (not 3.2.4). HQX and 444 DNxHR modes support (at 10bit) was added 8 days ago. I run 2 shorts test and ffmpeg implementation looks good. PSNR in my test was about 1dB better than AME implementation. Last edited by Andrew Kolakowski on Sun Apr 09, 2017 10:23 pm, edited 1 time in total. Andrew Kolakowski wrote: You must downloaded latest build (not 3.2.4- this had no HQX mode support), as this does support HQX mode now (at 10bit, not 12bit though). You're right - it was the nightly build 20170404-1229007, not 3.2.4. Corrected above. Andrew Kolakowski wrote: I run 2 shorts test and ffmpeg implementation looks good. It's just not very fast atm, but good news anyway for those who want to use DNxHR as intermediate format. Interesting that FFMS2Mod (regular FFMS2 and VDubFilterMod) can't (yet) decode the AME and FFMPEGDNxHR-HGX files correctly (as per cropped frame below) but can (thankfully) decode Resolve's DNxHR-HQX. Resolve DNxHR-HQX is 12-bit isn't it ? So I guess it's decoding the 10-bit variant specifically that presents an issue for FFMS2 and VDubFilterMod just now, until they are updated? Andrew Kolakowski wrote: ....you also needs to know that your software actually preserves 10bit (or whatever) depth and does not use eg. 8bit processing on the way. Anything based on VFW/directshow/QT quite often is going through 8bit at some point, that's why I said- make sure TMPEgenc is preserving 10bit in the chain. I did contact Pegaysys (or rather filed a 'Pre-sales Inquiry Form') about that, but have received no response as yet. Even so, the comparatively poor metric scores for all of the avi and mov transcodes speak for themselves. Bryan Worsley wrote: Interesting that FFMS2Mod (regular FFMS2 and VDubFilterMod) can't (yet) decode the AME and FFMPEGDNxHR-HGX files correctly (as per cropped frame below) but can (thankfully) decode Resolve's DNxHR-HQX. You need new build of FFMS2Mod- this was ffmpeg issue, but it has been fixed. It was hard coded to support only 12bit HQX files, where now it properly recognises bit depth which can be also 10bit for HQX. that's indeed a very useful comparison! the only variant i miss, are more optimized ffmpeg all-intra x264 and x265 tests, using similar bandwidth as traditional intermediate formats (> xavc-i class 480). well -- it's not the perfect choice for resolve with regard to performance, but the IQ metrics should be quite the same as for prores and dnxhr -- in case of the lossless mode even significant better! It was with just one source clip though, and one shot in log mode also. Like I said, I'd like to test a wider variety of GH5 4K footage, including clips shot in standard picture mode with full range 'luminance levels' - 0-1023 (10bit 422), as well as 0-255 (8bit 420) - and preferably with an exposure profile that spans the full range. Unfortunately, all of those native samples for download on Gordon Laing's Vimeo channel were shot in Limited range. In my tests with HD-AVC clips from various DSLR's shot at full luma range, something I've observed is that they invariably get auto assigned to Video Data Levels by Resolve. Then when transcoded (with the Media Management > Transcode function) to the available QT (mov) formats, the luma range gets clipped/clamped to Limited 16-235 (64-940) range. Whereas if set to Full Data levels it gets compressed to Limited range. Yet if you load the native clips on the Resolve timeline with the Clip Attributes set for Full Data levels and render out at Full levels the full data range is preserved, and likewise when generating Optimized Media. Just how the Pana GH5 UHD/422 (10-bit) files behave in that respect remains to be seen (I suspect no differently) but it's one reason why I am pleased we now have both ProRes-HQ and DNxHR-HQX options available for ffmpeg transcoding, because with ffmpeg the source luma range can be preserved. With Cineform transcoded (by Resolve) in AVI format though, the behavior is different. When transcoded with the Data Level set at Full, the original luma range is preserved and when these transcodes are brought onto the timeline at Full Data levels that is maintained. But when transcoded at Video levels, the luma range gets expanded out, as if [16-235] to [0-255] - so with native clips shot with full range, and with a scene exposure profile that spans the full range, you will see the luma profile expanded out and crushed (of course) at 0 and 255 (10-bit 0 and 1023). And likewise Limited (16-235) range sources will get scaled out to 0-255 (0-1023) That's why when transcoding to Cineform with Resolve I always go with AVI at Full Data Levels, as it leaves the choice of bringing the transcodes onto the Resolve timeline at Full Data Levels, so preserving the original luma range, or at Video levels with (virtual) clamping to Limited/Broadcast Safe 64-940 range, either way retaining the flexibility to apply Soft Clipping or Pull-Down/Up, if so desired. I'm not in favor of processing full range material compressed at limited range, although that's exactly how many consumer level NLE's handle such recordings (yuvj420p flagged that is)... and people seem to be fine with that, or maybe don't even realize that is what has happened to their precious recordings. I could post some examples of the above behaviors if it's of interest. That said, if this issue with import of the native Pana GH5 UHD/422 10-bit footage is sorted out (and not just for the Studio version) I think I would be more inclined to go with native import and Optimized Media (DNxHR-HQX at half res) for a native UHD project, rendering out to DNxHR-HQX also. That was my conclusion from tests with some native 10-bit XAVC-I footage. Martin Schitter wrote: ..the only variant i miss, are more optimized ffmpeg all-intra x264 and x265 tests, using similar bandwidth as traditional intermediate formats (> xavc-i class 480). well -- it's not the perfect choice for resolve with regard to performance, but the IQ metrics should be quite the same as for prores and dnxhr -- in case of the lossless mode even significant better! I did test ffmpeg encoded 10-bit x264 intra (lossless) and pseudo XAVC-I variants as well, but didn't include the results there because Resolve will not import them. I'll add the data if you like when I have a moment - not at that the PC holding those files just now. Hi Bryan, what Prores-HQ encoder are you using in ffmpeg? Michael Del Papa wrote: Hi Bryan, what Prores-HQ encoder are you using in ffmpeg? Bryan what do you think about the prores_ks compared to the prores implementation? Resolve also has an issue with ffmpeg's OP1a mxf format, but I'm wondering, if it could be modified to a compatible mxf format, might it then be possible to import these 10-bit 422 x264 transcodes ? Just a thought. Any bmxtranswrap experts know how that could be done? Last edited by Bryan Worsley on Wed Apr 12, 2017 7:49 pm, edited 1 time in total. It's not easy to make it working as you need to properly mimic XAVC spec, so Resolve XAVC decoder will be able to decode it. CBAC has to be turned off. You need to tag file as "avix". It would need a bit of work to find needed parameters. Not sure why are you trying to make XAVC working? I don't think it's worth it- stay with DNxHR or ProRes. Last edited by Andrew Kolakowski on Tue Apr 11, 2017 4:18 pm, edited 1 time in total. Bryan Worsley wrote: Resolve also has an issue with ffmpeg's OP1a mxf format, but I'm wondering, if it could be modified to a compatible mxf format, might it then be possible to import these 10-bit 422 x264 transcodes ? Just a thought. Maybe because Resolve is just reading is as generic MXF AVC file (with different than for mp4 AVC decoder). Andrew Kolakowski wrote: Not sure why are you trying to make XAVC working? Just to see if it could be done.....and with that wondering if there could be any way to get the native Pana GH5 10-bit 422.mp4 files into a compatible mxf format. With the lossless 10-bit 422 Intra (Hi444PP) format, I recall now there was an issue transcoding as mxf ("AVC Intra 50/100 supported only") - that's why I tested only mp4. Last edited by Bryan Worsley on Wed Apr 12, 2017 6:49 pm, edited 2 times in total. Well FWIW I have at least managed to produce a playable mxf file by demuxing the mp4 to the elementary h264 and WAV streams (converting the pcm_s16be to pcm_s16le in the process) and remuxing to mxf. And then after applying the above MXF modification (with bmxtranswrap) the file thumbnail does at least appear in Resolve's media browser and I can transfer it the media bin and timeline; Clip Details reports it as XAVC MPEG4. But when I try and play it, it alternates between flashes of deteriorate image and Media Offline. It's the Long GOP format that's the issue isn't it ? The way I see it - Resolve doesn't accept the native mp4 file because it expects 4:2:0, the ffmpeg mxf muxer doesn't accept the long GOP (as fed by a direct remux) because it supports Intra only (I think ? ), but will 'blindly' accept the demuxed raw h264 stream. Resolve accepts the bmxtranswrap modified mxf file, but takes it to be generic XAVC Intra. Most likely- you are trying to decode using XAVC decoder (which expects specific AVC parameters) file which is not really XAVC. Well that's pretty much exhausted my depth of knowledge and resourcefulness in exploring possible workarounds. I do hope the BMD team sort this out ASAP and in doing so also make native input of these GH5 10-bit 422 files available in the free Windows version of Resolve as well. I don't see what's so special about these files that this should be deemed a "Studio Only" feature. Glad the transcode test data I posted was of interest. All I can say is that judging from the view statistics for this thread it is clearly a subject that holds a lot of interest. Haven't been following it closely, but GH5 files are reportedly crashing Premiere. And Avid apparently doesn't recognize the files at all. Problems are reported with FCPX as well. At this point, lack of support for the files doesn't appear to be unique to Resolve. John Paines wrote: At this point, lack of support for the files doesn't appear to be unique to Resolve. That's consoling And the 400Mbps firmware update is still to come. quote "...this gives the software companies time to program changes so the media works"
No, it hasn't been resolved yet in the newest Build 252.
thanks bryan for your very useful extended list of comparisons. it's really useful, because objective tests and comparisons of intermediate codecs and their actual implementations are hard to find. and i think, not only me felt surprised about some of you findings and the common prejudices falsified by this empiric audit. but i still have to express some reservations against this general approach. you already mentioned the troubles concerning different interpretation of video levels as one obvious source of troubles related to this kind of intermediate transcoding. but that's just the tip of the iceberg. there are in fact lots of similar well known issues to face. losing timecode and metadata information, off-by-one frame differences, audio track arrangement, etc. -- the list is quite extensive. that's why i think, we should better see it just as a temporary workaround, not as a desirable or exemplary improvement in our workflows. sure -- i also use this kind of external conversation a lot in practice, because resolve is very unreliable and hard to customize concerning optimized media and caching. but from a technical point of view, it looks utterly clear to me, that this isn't the way, how it should be done. it's much more desirable, that applications are able to read and optimize all kinds of ingest footage, to minimize conversation related troubles. it's also the most promising solution, to really optimize the data in the most efficient internal representation for later use in a given software. all this other crazy complex workarounds simply can not do it any better. but as we can not change the world and somehow have to work around resolves actual limitations, your measurements and suggestions indeed make a lot of sense in practice right now. no -- i can not agree on this wishful thinking! for most h.264 implementations it doesn't make a big difference, if all-intra or the long-GOP variant is used. it's only the 8bit vs. 10bit difference, which leads to troubles. and this is a really challenging issue, because most hardware accelerated implementations (e.g. the quicksync features for intel CPUs) can not simply updated for 10bit use! that's why i think, it's more consequent to use h.265, if 10bit resolution is needed. in contrast to most common h.264 acceleration solutions, 10bit is widely supported in this h.264 successor. but the same limitations and incompatibilities will happen, if 12bit h.265 suddenly becomes more popular. 10bit h.264 was always a very troublesome exceptional phenomenon. sure, it's used in XAVC and AVC-ultra since quite a while, but beside this rare high end applications it wasn't used much often and is very bad supported in common software. you still have to compile x264 with different preprocessor directives and switch between both resulting libraries, if you want to have access to both possible bit depths. when the first GH5 footage appeared, i was quite surprised, that most of my daily used software was able to handle this kind of stuff -- because this kind of .mp4s where only used in the manga subculture for long time, but not by any serious consumer product. i really didn't expect, that it would work in any ordinary software, but i was wrong! in fact, it's much better supported then expected, but the mentioned limitations of most existing hardware acceleration possibilities draw a clear frontier of efficient use. Martin Schitter wrote: ....but i still have to express some reservations against this general approach. Very true, and sometimes "off by more than one frame" differences with ffmpeg - AVCHD.mts sources being a prime example, where there may be replicate start frames as well as deletions. That's why I prefer to do these metric tests with AVISynth/VDub rather than ffmpeg. Before running the tests I always check and make adjustments (trim) for any frame offsets. AVISynth will also throw an error if the frame counts differ. And I inspect the the YUV Histograms to ensure that there are no levels shifts (clipping, compression etc) that could prejudice the results. There were none with any of those transcodes of GH5 UHD/29.97 10-bit 422 ('Perpetua Dolly') clip, by the way. Mind you it was log, so there was nothing to clip anyway. 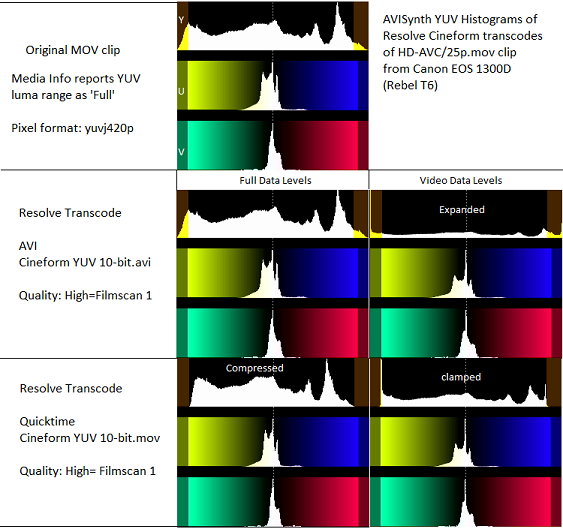 The AVISynth YUV Histogram reveals the full (0-255) data profile, with the brown bars marking the Limited range (16-235) boundaries.The original clip shows a profile typical of consumer/lower-end pro-line cameras, with a tendency to over-expose a little in the automatic exposure modes (Sony models especially) i.e. Rec709 Limited range but allowing for specular excursion into the superwhites. Transcoding with Resolve to Cineform YUV 10-bit.avi at Full Data Levels the original YUV profile is preserved, but when set for Video levels the profile is out-scaled [16-235] > [0-255]. Conversely, when transcoded to Cineform QT there is compression of the profile at Full Data levels and clamping at Video levels. Same with DNxHR-HQ. In this set I also included Cineform transcodes produced with AME (whilst I had Adobe CC running in trial mode) and VirtualDub FilterMod. Note the clipping/clamping in the AME Cineform.avi transcode, but not the QT one or the VDub FilterMod avi encode. Not exactly a high end camera, but it was recorded with full 0-255 luma range (flagged pixel format yuvj420p) and had an exposure profile that just spanned the full range. Same behavior. Martin Schitter wrote: ...that's why i think, we should better see it just as a temporary workaround, not as a desirable or exemplary improvement in our workflows. ....but as we can not change the world and somehow have to work around resolves actual limitations, your measurements and suggestions indeed make a lot of sense in practice right now. Bryan Worsley wrote: ....That said, if this issue with import of the native Pana GH5 UHD/422 10-bit footage is sorted out (and not just for the Studio version) I think I would be more inclined to go with native import and Optimized Media (DNxHR-HQX at half res) for a native UHD project, rendering out to DNxHR-HQX also. That was my conclusion from tests with some native 10-bit XAVC-I footage. Martin Schitter wrote: that's why i think, it's more consequent to use h.265, if 10bit resolution is needed. in contrast to most common h.264 acceleration solutions, 10bit is widely supported in this h.264 successor. but the same limitations and incompatibilities will happen, if 12bit h.265 suddenly becomes more popular. Bryan Worsley wrote: Very true, and sometimes "off by more than one frame" differences with ffmpeg - AVCHD.mts sources being a prime example, where you may get replicate start frames as well as deletions. That's why I prefer to do these metric tests with AVISynth/VDub rather than ffmpeg. ... AVISynth will also throw an error if the frame counts differ. with avisynth you may have the possibility to choose alternative codec implementations on windows, but on linux you usually have to be content with ffmpeg/libav and its different ways (e.g. accelerated or not) to handle this file formats. using vapoursynth or any other application doesn't make much difference on this platform. and on apple systems it will look different again. Bryan Worsley wrote: Transcoding with Resolve to Cineform YUV 10-bit.avi at Full Data Levels the original YUV profile is preserved, but when set for Video levels the profile gets out-scaled [16-235] > [0-255]. Conversely, when transcoded to Cineform QT there is compression of the profile at Full Data levels and clamping at Video levels. Same with DNxHR-HQ. yes -- but that's more or less an well known limitation of the quicktime container format and the very questionable workarounds used by different applications. yes -- in many ways i have to consent with your conclusions too. sorry, i can not take this article serious. if someone wants to tell me, that h.265 is only an long-GOP codec, he is simply wrong. 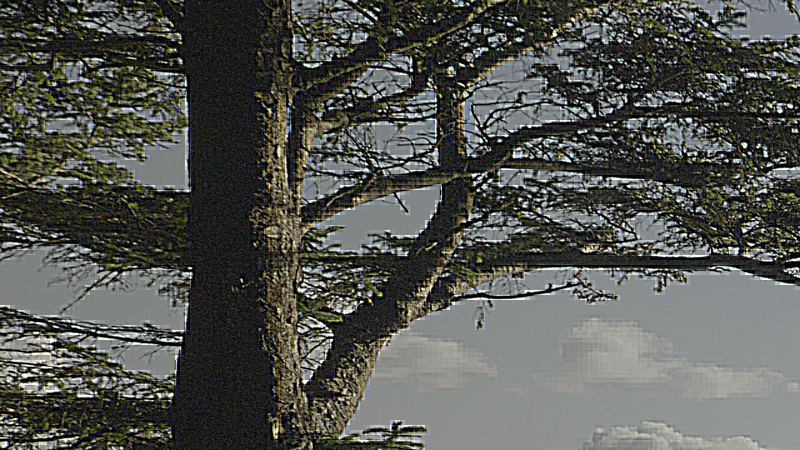 h.265 and the derived BPG image compression is in fact a fabulous solution for all-intra usage as well. I don't quite follow that. The QT Cineform and DNxHD/HR export options in Resolve preserve full data levels when set accordingly. So why the different behavior (compression) observed with the Resolve QT transcodes when the source clip attributes are set for full data levels ? It does say that doesn't it "By it’s very nature, H.265 is a long-GOP codec which does not store every individual frame as would an ALL-I recording mode." H265 is pretty much uncharted territory for me, but even I know that's wrong. I was experimenting with some ffmpeg commands for 10-bit intra 422 x265 just last night. Bryan Worsley wrote: I don't quite follow that. The QT Cineform and DNxHD/HR export options in Resolve preserve full data levels when set accordingly. So why the different behavior (compression) observed with the Resolve QT transcodes when the source clip attributes are set for full data levels ? quicktime containers do not have a simple flag to signify the data range. you have to use other means to communicate this information. that's one of the main differences between quicktime and mp4 containers, although they have otherwise a lot in common. but this technical limitation alone wouldn't do much harm, if not all applications would use different strategies to mimic the behavior of other implementations or codecs, but often allow or choose data range settings and pixelformat combinationsin the video stream, which were never provided or commonly used by those imitated examples. I stumbled a cross this thread from Googling but I just got my GH5 today and also downloaded Resolve for the first time, so it's more than likely a simple mistake but at the moment I'm getting a "Media Offline" when importing 10bit 4k footage. Where am I going wrong? I'm using the Resolve 14 public beta. Thank you, sorry I wouldn't normally double post like that but it had been a few days and no one had picked up on my question.